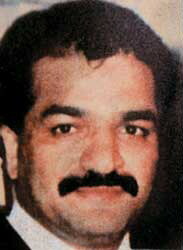 Ibrahim Mushtaq Abdul Razak Memon (born 24 November 1960), better known by the nickname Tiger Memon, is a primary suspect in the 1993 Mumbai bomb blasts case. He is wanted by Interpol and the Central Bureau of Investigation (CBI). He is a member of D-Company, a gang led by Dawood Ibrahim. He got the nickname Tiger after helping a petty drugs and weapons smuggler to evade the crime branch of Mumbai Police by driving his car recklessly over 100 km/h on one-way roads. Memon's role as the prime accused in the blasts was confirmed by a Special Court set up under the terms of the Terrorist and Disruptive Activities (Prevention) Act after the conviction of the others accused in the case. On 15 September 2014 the special TADA court, hearing the long-drawn-out case around the 1993 Bombay bombings, convicted four members of the Memon family: Yakub, Essa, Rubina and Yusuf. Three other members of the family—Suleiman, Hanifa and Rahil—were acquitted because the judge gave them the benefit of the doubt. The four convicted Memons have been held guilty on charges of conspiring and abetting acts of terror. They face jail terms ranging from a minimum of five years to life imprisonment. Yakub Memon, the younger brother of prime accused Tiger Memon, had been charged for possession of unauthorised arms and was executed by hanging on 30 July 2015 in Nagpur jail. As of 2018[update], Memon was still at large. The activities of Tiger Memon were a major part of Anurag Kashyap film Black Friday (2007), which is based on the 1993 Bombay bombings. Memon was played by Bollywood actor Pavan Malhotra. ^ "The ones who got away". ^ "Tiger dons new face in Dubai". DNA. 17 September 2006. Retrieved 30 May 2018. ^ "1993 blasts: 98 punished, big fish still free". Hindustan Times. 22 March 2013. Archived from the original on 23 March 2013. Retrieved 30 May 2018. Glenny, Misha (2008). McMafia: A Journey Through the Global Criminal Underworld.